These same parts are used for Etalon and Tesa 6", 8" and 12" dial calipers made in Switzerland. Movement assembly 025644 (item #19 in the drawing) conveniently includes all three gears . Note that the movements are different for the inch and metric calipers. Some gears are no longer being sold separately by us. 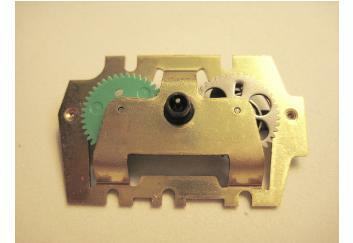 It will make a repair faster and less complicated when you simply install the new movement. If you need some assistance or hints on doing your own repairs, you may want to take a peek at page 44. B&S and TESA parts are identical (TESA is the manufacturer). B&S numbers are used in the U.S.
Are you looking for repair tools? Check to see what the professionals use on page 31. Caliper spare parts are no longer available online. We are willing to sell off the balance of our stock in bulk only. Please inquire by email. dial for 599-579-4 (white) 6", 8", 12"
How about a convenient and safe place in which to store your parts? Screw #20 used to be shorter than screw #18, just as you see in the drawing at the top. The new models have done away with this short screw and now use the larger screw in its place. You can retrofit without problems. * the metal housing with bezel does not include the plastic sockets. The bezel is already mounted as is the bezel lock screw. Sockets will have to be ordered separately, if needed. ** if you replace the rack, you will also have to replace the adhesive scale (#26). *** four plastic sockets are used in assembling this gage. The central openings may be oblong or round. These sockets are often destroyed in the process of disassembly and will need to be replaced. Gib stripe, the coppery metal strip is now used in place of the two former parts (the black plastic strip and the spring metal strip). You will only need one gib. We don't know why B&S chose to call it a "stripe". Crystal replacement for current models (be sure you have the model number correct): the old crystals (clear plastic) could be removed with a simple tool that acts like a suction cup but in our experience this seldom works. You may have no other choice but to break the crystal in order to remove it. You can improvise other methods but you're likely to cause damage. If the bezel is still round and in very good condition, you can probably just press the new crystal in place using your thumbs. If the bezel is dented or bent out of shape, then it's best to leave this to someone with the right tools. Crystals for the older 599-579-12 calipers are no longer available. We do not have any substitutes. Obsolete model 579-1 uses crystal number 39-1/2. Please see page 233. Older Etalon models, with 35.5 mm bezel opening will use crystal BS 579-2. This crystal is no longer available from us. Older B&S model 599-579-2 calipers will use the BS 579-2 crystal which can usually be pressed in place without any tools. This crystal is no longer available from us.